Two birds found in separate cities in San Mateo County tested positive Wednesday for the West Nile virus, San Mateo County Mosquito and Vector Control District officials said. The dead American crows were collected from Atherton and Redwood City and are the first indication of the virus in the county. District officials will start collecting mosquitoes in the area where the birds were found and have them tested for the virus. The results will be available next week. If the mosquitoes test positive, then the district will spray to reduce the risk of transmission of the virus to residents, according to Megan Caldwell, the district's public health education and outreach officer. People can get the virus by being bitten by an infected mosquito but someone cannot transmit the virus to another person. Four other Bay Area counties -- Contra Costa, Marin, Santa Clara and Solano -- as well as Santa Cruz County have reported dead birds that tested positive for the virus, according to the state's West Nile virus website at westnile.ca.gov. San Mateo County vector control district officials said the risk of residents getting the disease is low, but they are encouraging residents to report any dead birds or dead squirrels to the California West Nile virus hotline at westnile.ca.gov or 877-WNV-BIRD (968-2473). 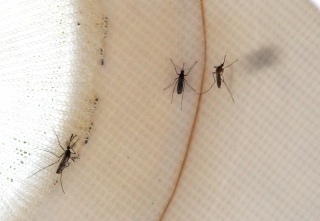 To reduce the risk of getting bitten by a mosquito, district officials suggest draining all sources of standing water since mosquitoes lay their eggs in standing water. They also suggest wearing clothing and repellent when outside at dawn and dusk, the times mosquitoes that transmit the virus are most likely to bite, and to use repellent containing DEET, picaridin, oil of lemon eucalyptus or IR3535 to keep mosquitoes from biting.